Some LabelWriter 450 and 450 Turbo label printers manufactured after April 1, 2014 will not install properly on computers running Windows 7 when connected through a USB 3.0 port. DYMO has a software update available that will fix this problem. For assistance, check here to determine if your label printer is affected and to install the software update. You can also call DYMO Customer Support at 1 (877) 724-8324, Monday-Friday, 8 am – 6 pm (EST). I having trouble connecting my LabelWriter 450 Turbo to my 2014 MacBook Pro. I not certain if its is compatible or not. Trying to get some help before I take this damn thing back to the store. Could you make sure that you are using latest version of DLS for mac? You be able to download latest firmware and update your printer too. Try those steps and let us know if you have any issue. Also, could you tell us what version of os are you running on? Is there a Windows 2012 Server version driver for the LabelWriter 450 Turbo? Sorry Scot, we don’t support windows server. The printer works fine from Dymo Label Software and MS Word; the check environment test (http://labelwriter.com/software/dls/sdk/samples/js/CheckEnvironment/CheckEnvironment.html) shows true for both isFrameworkInstalled and isBrowserSupported. There is an issue, though, with Label Proxy Service that cannot be started, but it should not matter given that I am trying to print from the same machine where the printer is connected via USB. I have been reading and re-reading the rather scant and sparse docs about the Framework but cannot find a solution. I will much appreciate any help to solve this matter. Thank you dymodev. I experienced the same problem with Safari, so I suspect my problem runs deeper than browser plugins, but I will check and see if I can solve the problem at least in Chrome. No way to solve it, at least none that I can find. Hi Gianni, did you solve this? I am trying to print on a Dymo 450 turbo from a 2011 MacBook Air but the framework is not finding the printer. It can print fine from the Dymo application though and web services is running. We have just got one of your DYNO printers and are using it for printing 1-2 cells in excel at a time. 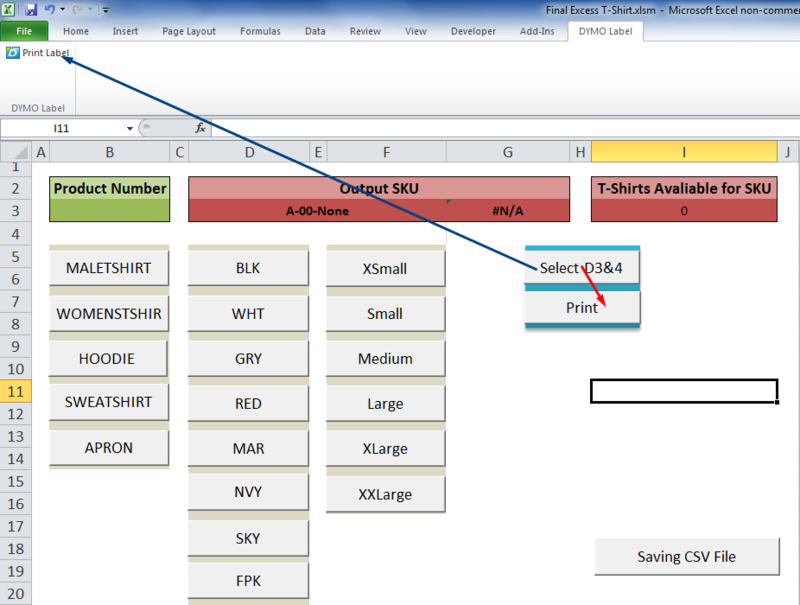 Your excel add-in is extremly useful because of the quick-print application but am trying to make it quicker. and the Blue arrow shows what we’re having to do at the moment. So what i’m asking, is would you be able to share the code/working code in which i can make the Print button to work instead of having to click the DYNO Excel Add-in button. Unfortunately, we can not share our plugin code. It is possible to write your own plugin to Excel that uses the DYMO Label Framework to perform the desired functionality. You can download . I printed one stamp on the twin turbo today. Then when printing the label a message told me to download newest Dymo Label – 8.5.2.95. Now I can’t print stamps or labels. Is the twin turbo no longer working on Macs??? I’m sorry that you are having issues with printing. This blog is for helping developers use the SDK that is provided for the printers. If you would please contact: DYMO Customer service at 1 (877) 289-3966, one of our representatives can better assist you in solving your current problem. I developed asp.net web application with working dymo sdk.I access address.label file and sdk dlls into c# code.Web application working fine on my local pc but when I publish on web server it does not work.Because it does not find connected dymo machine. I recently install Window 10 and now my Dymo Labelmaker 450 is no longer working. I have installed the latest driver off you website and it still does not work. Do you have any solutions? I am not able to duplicate the issue with DYMO Label Software (DLS) v.8.5.1 on Windows 10. It is printing just fine to DYMO LabelWriter 450. Did you upgrade your Windows? Have you reinstalled DLS? Are you having the issues with DLS or your own application using the DYMO Framework? The machines have been working fine for some while, and were working the morning of the Windows 10 installs, but have not worked since. Hi Tim, Have you applied the update that is refereed to the original post? Specifically, which printers models are you having issues with? Im connected to a DYMO labelwriter 450 by usb….but the other people in my office can not get connected to it ?? what can i do ? All of my computers now fail to recognize my DYMO 450 Turbo when I try to plug it in via USB. Each time I try, I receive the USB Device has Malfunctioned error. I have tried plugging in the DYMO to different computers and used different printer cable, but I continue to receive the same error message. If I plug in another USB device to the same USB plug, that device works without problems. Windows 10 did just receive an update on my computers, so I am concerned the latest update has caused a conflict with the DYMO printer drivers. Can you provide any insight into this, or help me discover why my DYMO is failing to connect? Thank you! Hi, This blog is mainly for developers seeking help using our SDK. I’m trying to build a simple JSP to retrieve an item from our Item-DB and print its EAN Code on a Labelwriter 450 Twin Turbo. Driver version 8.5.1 ist installed (fresh version retrieved today) and I can print a label manually via DYMO Label software. The Add printer tool also finds no printer. Forgot: OS is Windows 10. I found this page as a top Google result. What confused me was I could hear the recognition sound when plugged/unplugged. It was showing as on control panel as a “Device” like my mouse and keyboard. Solution: Plug in Dymo. Open Device Manager. It will be listed ironically under Printers. Update driver. I have a 400 series printer hooked up to a PC working with a web-based printing app. Works brilliant in most of the cases. However, sometimes the connection between the printer and pc is lost and print-jobs end up in the que. The only solution is to power-off the printer, reconnect the USB and re-power. Downside is that users tend to do this themself, but the print que still exists; resulting in many, many labels being printed. Did you ever find a solution to your printer issue? I am having the same problem and have been unable to find a resolution short of replacing the printer. Could you please provide details about your printer problem? I have windows 10 and I have DYMO 450 Turbo installed on my computer. I went to use the software the other day and it wont open; it keeps bringing up a fatal error dialog box. So I have uninstalled the software and reinstalled it but it keeps telling me the same thing. Could you please help? Can you please send the fatal error text shown within the dialog box? A screenshot would also help. Within the past 2 weeks our Dymo Label Makers that are all connected to their own Dymo Print Servers have been losing connectivity. Requiring us to power cycle both the print server and printer several times. I have reset all of them to default settings. Not sure if there was a Windows update that killed this. Nothing has changed on my network. I can also ping the devices and every minute or so I lose 3 packets in a row, this correlates to watching the printer server activity lights. I have contacted Dymo support and I am told there is no firmware updates nor driver updates, instead I was referred to the useless Dymo Print Configuration software. It does absolutely nothing. Anyone having issues??? Can you tell me what printer model(s) you are using? What sort of problems are you having with the DYMO Print Configuration software? Have you tried these printers independently and/or on another network? If this doesn’t help, please let me know and I will see if the printer server team has any suggestions. I had an old 350 turbo and upgraded to a 450 twin turbo a couple of years back now, and have never had any issue until today! Fresh install of Win 10 home x64. Dymo web service is active and knows the printer is there, windows device manager sees the printer, knows its there and what not. I can select it and print to it from word etc. But the label manager is fubar! I’ve uninstalled, restarted and reinstalled several times with no success! Also tried an older version v8.5.3.1889 i had laying around and same problem! Anyone had this happen/got any ideas? I’m all out of ideas and its a heavily used printer i really need up and going asap! Are you a developer or end user? Connect the USB cable to your computer and click the download button below. Installed the 450 turbo. Added labels to both sides. Created a label but can not print. Indicates there are no labels in printer. I hold the blue button down for 10 seconds, it prints. Which browsers are you testing with? What version of DLS are you using? iMac running OS 10.13.6. Demo Label Writer 450 Twin Turbo running software version 8.7.2.20. Keep getting message “offline.” If I reset by unplugging the Dymo, dump the printer from my iMac, plug the Demo back in and reinstall the Dymo it works fine. If I don’t use it for a few hours or overnight, I get a message again that the printer is “offline” and it will not work until I do the restart routine again. I’ve tried downloading and installing the new Dymo software to no avail. This website is for questions using our SDK for DYMO printers. It sounds like you are having issues with your printer. for help with your issue. I recently bought LabelWriter-450 in Australia. Windows couldn’t download the software. I need to use this printer as soon as possible and therefore need your help!